When a cowboy starts collecting Western art, you’d expect to see a lot of horses and saddles. That’s not true for Utah rancher George Wanlass. 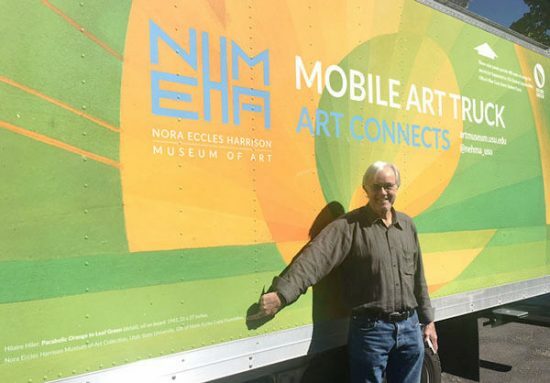 As he amassed art for the Nora Eccles Harrison Museum of Art, he was drawn to abstraction, minimalism, transcendentalism, even Funk assemblage. 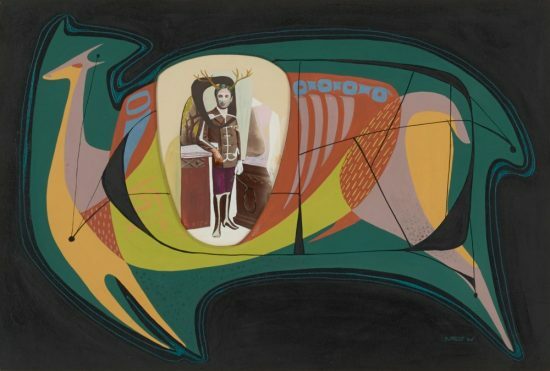 Dorr Bothwell, Stag’s Heart, 1946. Gift of the Marie Eccles Caine Foundation. Collection of the Nora Eccles Harrison Museum of Art, Utah State University. 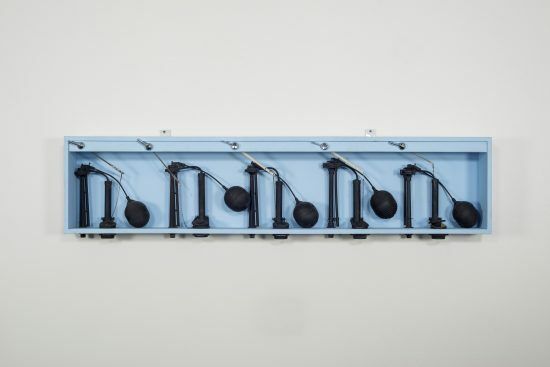 In this interview with Bolton Colburn (former director of the Laguna Art Museum) Wanlass offers his take on what it means to be a collector, a process that’s often like “hunting in the dark.” The edited interview is an excerpt from the extensive (75 contributors) exhibit catalogue. The visionary collector–the great-nephew of museum founder Nora Eccles Harrison–gathered the work over a span of 30 years. Even those of us who love the traditional boots-and-saddles will be inspired by Wanlass’ all-embracing approach to the West. BOLTON COLBURN: How did you come to art collecting, particularly for the Nora Eccles Harrison Museum of Art? GEORGE WANLASS: My interest in art really started with my grandmother, Marie Eccles Caine. Many pieces in the museum are marked, “Gift of the Marie Eccles Caine Foundation.” She was a great lover of beauty, but besides that she’d attended art schools in New York and in Chicago. This was a very unusual thing for a young woman in Utah early in the twentieth century. She was acquainted with Mahonri Young, Gifford and Reynolds Beal, and local artists like Henri Moser. I always loved and appreciated the Moser landscape painting in her home, because it was associated with her. The important thing she gave me, perhaps the first ability that one needs in order to appreciate art, was a willingness to look. Many people enter a museum, and walk by art, and never really look. Once I saw a couple at the museum who made a complete circuit of the downstairs gallery in maybe four minutes, and they never stopped to look at anything. If you don’t stop and look, you’ll never see anything. My grandmother taught me to look. On our drives up Logan Canyon, a local beauty spot, she would say, “Oh, look at that! Oh, look at this!” Her emotional reaction to what she was seeing encouraged me to look. That was an important experience for me, because I began to see what she could see, maybe not in its entirety, but at least in part. A second experience, instrumental in teaching me something about the value of art itself, derived from trips to Europe when I was sixteen and seventeen years old. My mother dragged me through every art museum available. I remember that I was resistant at the time, but my resistance paled. I began to appreciate the fact that this was valuable, exciting, and enriching material that I should be paying attention to. Strangely enough, my first profession was dairy farmer. I attended Amherst College, then graduate school at the University of Kansas. From there I went on to Stanford University. At some point I became disenchanted with the idea of a future as a teacher of history. I decided I wanted to go into agriculture, so I took a blind leap and became a dairy farmer. Concurrently, I came across a very small painting by Henri Moser in a local junk shop priced at seven dollars. As I paid for it, the woman said, “Oh, you’re buying that for the frame, aren’t you?” And of course, I didn’t say anything, which is a good policy to follow if you’re going to be an art collector. You don’t want to let people know what it is you’re collecting, because then the prices go up. It was the beginning of a collection of Utah historical art. Timing is so critical; you can’t collect things that are not available. But at that time, there was a great flood of historical Utah art coming from several different sources, and there wasn’t much of a collecting audience. 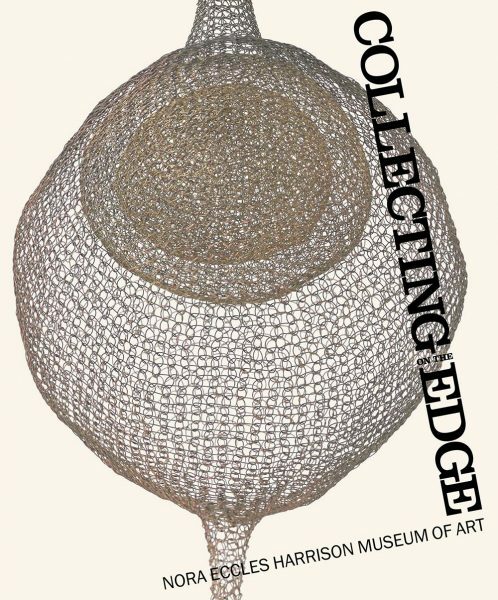 Collecting on the Edge at the Nora Eccles Harrison Museum of Art. 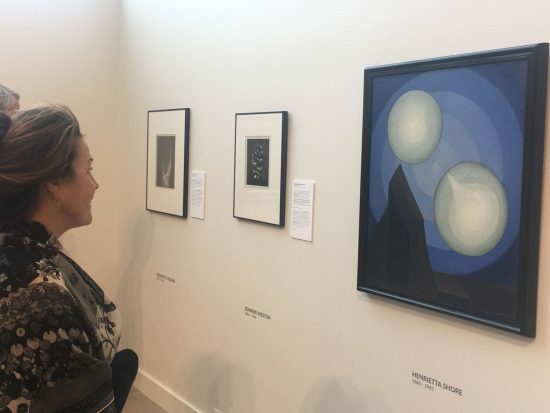 A visitor admires Two Worlds by Henrietta Shore. My history as a collector for the next twenty years was constrained by the fact that I could only leave my extremely demanding occupations, first dairy farming and then ranching, for very brief periods of time. I also lacked funding. Fortunately the art I was looking for was not expensive at the time. I amassed quite a sizable collection of Utah artists. My goal then was to buy at least one piece by each of the many historically significant Utah artists. That’s where I started. When the art museum came along, I thought, “Well, great, I’ll continue my collecting, and we’ll go from there.” With the support of the Marie Eccles Caine Foundation I bought a Cyrus Dallin sculpture, The Challenge, for the museum, and then a Mahonri Young sculpture, Right to the Jaw. There was a minor celebration at the museum when the Young sculpture was unveiled and the university president came. I don’t know what others thought, but I believed that this was the beginning of big things. Shortly afterward a new director was hired, Peter Briggs. For about two and a half years, he poured himself into the place, and it began to resemble a real museum. Briggs’s expertise was in prints and in the art of New Mexico. He and I went to Santa Fe and Albuquerque. We looked at art by Oli Sihvonen. We tried to visit Charles Maddox, but Charles forgot his appointment with us. We did see Frederick Hammersley. We were onto the fact that there were some important artists out there. 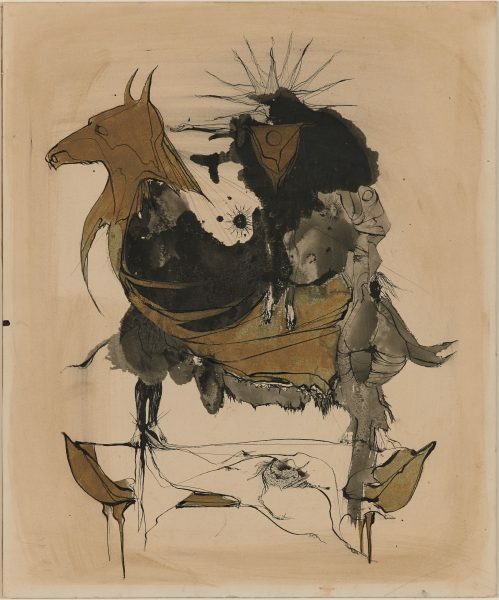 Marjorie Cameron, Untitled, 1955 Gift of the Marie Eccles Caine Foundation. Collection of the Nora Eccles Harrison Museum of Art, Utah State University. BC: What was your relationship with dealers? GW: I learned to value certain dealers. I don’t think a collector can achieve anything totally on his own. The dealer Tobey Moss was a great source and an important connection for the museum. She had access to Lorser Feitelson’s estate, and Lorser himself was a collector. She also represented the Peter Krasnow estate, Jules Engel, Helen Lundeberg, June Wayne, and many other important Los Angeles artists. So I had this connection, and after Peter Briggs left, I continued it. I bought Post-Surrealist works by Lorser Feitelson, by his wife, Helen Lundeberg, by Ben Berlin, sculpture by Krasnow, and much more from Tobey. At that time, if one wanted to learn about these artists, or this period of time, California art from 1920 to 1950, there were no good reference books. I think the first catalogue I ever saw that considered early modernist L.A. artists was Turning the Tide. It was like hunting in the dark, first one lead, and from there to another, on your own. For instance, once I looked at a Ben Berlin painting at a dealer’s. I had to decide whether this was of no great value or was an important piece of art. It wasn’t like the dealer knew which it was; she had a relatively low price on it. Obviously she valued it, but not very highly. This painting subsequently became the cover illustration for the Pacific Dreams catalogue. Dealers were often surprisingly interested in my opinion of worth. I thought that was indicative of the fact that they didn’t have any good reference material—any record of shows or of the historical market. For a collector this is a wonderful situation, and I took advantage of it. I had a limited amount of money to work with, and if I could make it go further, that was all to the benefit of the museum. As the collection began to grow, my ability to look at things and judge their value also grew. Not so much their monetary value, because I don’t think that’s ever really been important to me. I’ve never resold anything of my own, and I know the museum has never sold anything that I bought for them. There should be some importance attached to art as it finds its place in the historical record, and I was beginning to be able to gauge that. My training came from the artists I was buying. If you look closely, and you pay attention to what you’re seeing, you begin to be schooled by skilled artists. There’s a native visual aptitude, you either have it or you don’t. But beyond that, you can be trained. If you’ve seen drawings from the schools of the early nineteenth century, these were places where wealthy people were trained in the art of illustration. One could become very accomplished at a certain level. Rather than studying painting or drawing, I learned what I learned in a purely visual sense. BC: Can you give some examples of what and how you collected? GW: In San Francisco I bought Jay DeFeo’s Dr. Jazz for what seemed like an astronomical sum of money to the other members of the foundation. I also bought a Robert Irwin disc for approximately the same amount. My strategic approach was to save the big-ticket items until the end of the fiscal year, and it worked out fine for a while. But the foundation members wanted an explanation of why I was buying what I was buying. It was very difficult to explain to the unknowledgeable why something was important, when they didn’t make any effort to research the material I provided them. I was resistant too. I was running a ranch. I didn’t have time to work on developing explanatory material. In part the rupture was my fault. As I said, I didn’t have any support. I didn’t have anyone to turn any responsibility over to. I was also making a monetary sacrifice, because everything I did was on my dollar. I didn’t charge travel expenses to the foundation, I paid them myself. And I must say, my ranch was not what you would call an economically successful enterprise. The pursuit of art was very demanding. I remember running from gallery to gallery to museum when I went to San Francisco and Los Angeles, because I didn’t have much time, and I wanted to see more, and find more things. I went to New York, I went to Santa Fe looking for art. The best part of it was that affordable and desirable art was available. Remember, if you’re a collector, and you have an opportunity to buy something today, you better buy it if you think it’s going to be anything at all, because tomorrow it’s going to be gone, and it might never reappear. Sometimes material shows up suddenly, and artists are suddenly accorded new importance. 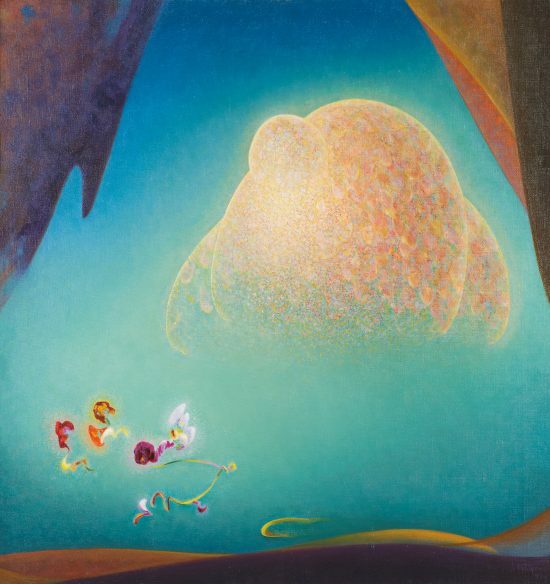 Agnes Pelton, Nurture, 1940. Gift of the Marie Eccles Caine Foundation. Collection of the Nora Eccles Harrison Museum of Art, Utah State University. Agnes Pelton paintings stored in a farmhouse in Northern California suddenly showed up on the market. It’s unlikely that we will see any more Pelton paintings of that quality for sale. Something similar happened with the estate of Henrietta Shore. There was this little show of her paintings, material that had been stored on a Canadian farm. There were two I was interested in: one was Two Worlds, which I bought, and the other is now owned by the Los Angeles County Museum of Art. Here it all was, and then all of a sudden it was gone. I learned to take advantage of circumstances, even though sometimes the work seemed expensive. Henrietta Shore’s Two Worlds was in the Whitney’s retrospective of twentieth-century American art. That’s a significant painting in the bigger scheme of things. There were dealers I relied on for introductions to artists and to artists’ estates. One of them was Paule Anglim. She had several San Francisco artists in her stable that she thought were important, and I came to believe likewise. One of them, for instance, was David Ireland. I remember going to Ireland’s house before he died and getting a tour. Such an experience is not replaceable, and one remembers it always. He came to Utah State University and gave a talk about his sculpture Ego, which I bought, in a way that would make sense to anybody. Ireland was a real nuts-and-bolts guy. He didn’t talk art theory. He spoke about what he did in a very prosaic and totally convincing way. When he finished, what might seem to be a bunch of sticks in a cabinet could clearly be perceived as an important work of art. George Wanlass. Photo courtesy of the Nora Eccles Harrison Museum of Art. So a collector receives not just the thrill of buying something but also the enjoyment of the art itself, the realization that one is going to be able to enjoy it indefinitely. In addition there’s a great reward to be derived from the opportunity to meet the artist. Many of these artists are memorable. They’re intelligent and they’re creative in a way that I can only begin to fully appreciate. I was being paid back royally all the while I was collecting. I’ve lived with an artist now for twenty years, my wife, Karen Carson, and I’ve watched her create. I have a chance to walk into her studio on a daily basis and see her confront problems and solve them. It gives me an entirely different appreciation of what a difficult profession art is. Not just the selling of the things you make, but more importantly making them successfully. I watched her create a painting series in a barn studio at my ranch in Idaho, upstairs over the horse stables. She began to paint banners. I had no experience with banners as art. I wasn’t sure that banners could ever become real art. I thought, “Hmm, I don’t think this is going to go anywhere.” And then over time, she works it, and she works it, and in the end she creates something unlike anything ever seen before, and it’s wonderful. Noah Purifoy, Untitled, 1990. Assemblage of wood, plastic and metal. Gift of the Kathryn C. Wanlass Foundation. Collection of the Nora Eccles Harrison Museum of Art, Utah State University. a most! uplifting article, dear ann! what a planet we would have with more of “this”! and less of “that”! Infinite thanks and wishing you well in every way. Dear Ann: What a noble pursuit “Art.” Anyway you deliver the subject is delightful! I look forward to the article you write. I was lucky to have lived at a time when I knew great artists. Please keep up the great articles like this on the subject. Thanks for your attention and eye opening interest in the subject. Your other comments here say it all. Thanks for making this site so interesting!